Grangers International, the manufacturer of three renowned aftercare brands Cherry Blossom, Fabsil and Grangers, has confirmed that work is complete and its new headquarters near Chesterfield, Derbyshire, will officially open in February 2019. 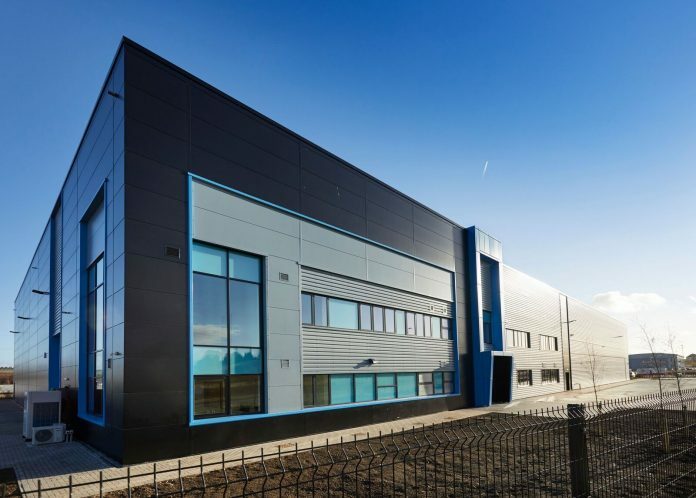 The keys to the new 43,000 square feet headquarters at Markham Vale, built by G F Tomlinson in partnership with Henry Boot Developments, were handed over to Grangers International on Friday (30 November). Occupying a 2.8 acre site, the new custom-built headquarters will bring all of the business’ core functions under one roof including its manufacturing arm, distribution, finance, design, sales and marketing teams. Grangers International, which was founded and set up operations in Watford more than 80 years ago, has partnerships and supplies private label aftercare to some of the biggest footwear, clothing and outdoor equipment brands in the world. These partnerships include Dr Martens, Ecco, Jack Wolfskin and Rapha. The company moved to Alfreton in Derbyshire in 1990, continuing to manufacture an increasingly wide range of aftercare solutions including its environmentally-responsible waterproofing, cleaning and protection products for technical clothing as well as footwear and equipment, under the Grangers brand. Karolina Jones, General Manager at Grangers International, said: “Grangers International has just recorded its biggest year of growth on record and the company has seen over 40% international year-on-year growth in volume for the second year running in 2018.